I’m a bit surprised that I’ve never seen it online before or since as those vitriolic ‘EA is teh evil’ posts always get hits. Quite alarming in retrospect and I can only assume that it seemed like a good idea at the time. Isn’t coincidence a strange thing? Fall of Liberty seems to be depicting a similar version of fascism-invaded and destroyed NYC, which might not have been the smartest thing to do, given what has occurred there since the RA2 advertisement. What issue and page no of FHM is this from? I can’t remember exactly. I only have that page because, like I said, I saw it in a random copy of FHM in the barber and they let me take that page. 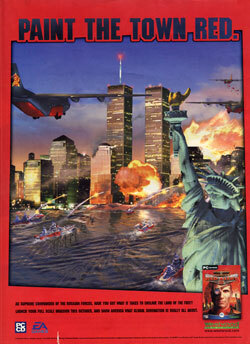 Within the couple of issues either side of the UK release of Red Alert 2, which was in October 2000.